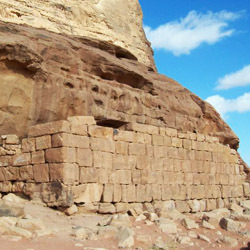 Archeological evidence shows that Wadi Rum Desert in Jordan has been inhabited since prehistoric times. A recently excavated site to the south indicates settlement at least as early as 4500 BC. In the 8th and 6th centuries BC, the area was known as Wadi Iram. With the fresh-water springs making it an ideal stopover for caravans traveling between Arabia and the Levant. 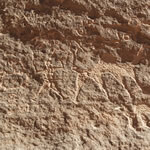 Furthermore, inscriptions show that the Bedouin tribes of Ad, Thamud, Lihyan and Main all gathered here. The Nabateans certainly made their mark here in Wadi Rum as well. With the 1st century BC remodeling of the temple at the foot of Jabal Rum (just west of Rum Village) and a more recently excavated site 8.5km to the east of the village. 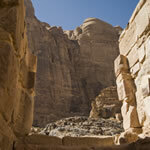 Consequently this site is believed to have been occupied prior to Petra. 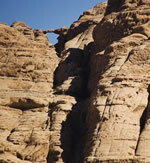 Wadi Rum is famed for its link to T.E. Lawrence the original “Lawrence of Arabia”. Along with Prince Feisal bin Al-Hussein, he made his base here during the Arab Revolt of 1917-1918. At the center of Wadi Rum village is the Desert Police fort. Built in 1932 the village remained nothing more than a cluster of tents until the 1980s. 1962 is when David Lean arrived to film his world renowned “Lawrence of Arabia”. Filmed onsite here in Wadi Rum, the film won seven Academy Awards. Revealing for the first time, the dramatic landscapes to the Western world. The 1980s marked the arrival of renowned British climber Tony Howard. Inspired by the film’s stunning backdrops, he came to publish the region’s climbing routes. As a result the tourist boom of recent decades began. And furthermore, this has brought thousands of visitors from across the globe to the spectacular Wadi Rum Desert in Jordan. As in T.E. Lawrence’s day, the area’s prominent tribe is the Zalabiah tribe. Our family is proud to be apart of this tribe which has been charged with the protection of Wadi Rum Desert in Jordan to this day! Named after the famous film shot here in the early 1960s, this natural spring has been used since Nabatean times as a stopping point on the caravan routes from Arabia to the Levant, the nearest water source beyond the Rum area being 40km away. While a pipe now carries the water down, you can still make out the winding road once used to lead livestock to drink directly from the spring. Bounded by soaring cliffs painted with intricate rock formations, this canyon has a narrow siq reminiscent of Petra. Just up the steps at the entrance are a set of ancient inscriptions, some dating back as far as 350 BC. Further along, you’ll also find the broken remnants of a Nabatean dam. The five-minute climb and five-second descent of these giant sand dunes is one of the definite highlights for Wadi Rum visits. In addition to the smooth red sand, the dramatic backdrop of Jebel Nasraniyah and Jebel Umm Ishrin’s sheer cliffs make it a great place for photos. The smallest natural arch in Wadi Rum, this rock brige has beautiful panoramic views from the top of Kor al-Ajram, Jebel Rum and Khazali Canyon. This set of Nabatean inscriptions was etched to mark routes and give signals to passing travelers. Some point out the area’s water sources while others warn of its various dangers. Others show the winners of the winter camel races that once circled this mountain. This arch is set just a few meters above the sandy desert floor, so you can climb right through this arch in just a couple minutes, with spectacular views on either side. At the edge of a wide red sand valley, this small stretch of white sand, formed from broken rocks at the top of Jebel Anfeshiyeh, makes for a striking contrast. Views of Jebel Barra and Raddeh Beyda across the valley are breathtaking. Just a few minutes’ walk from our family home in Wadi Rum Village, this extensive ancient Thamudic temple was renovated 2,000 years ago by the Nabateans. Its remains are set just beneath the sheer eastern face of Jebel Rum. Set on the top of Jebel burdah, this stunning rock bridge is the largest in Wadi Rum. While it is visible from all across the valley below, it is a 2 1/2 hour climb to the top in order to see it up-close. Hikers call it one of the most rewarding trips in Wadi Rum. Long before Lawrence passed through, Bedouins took shelter from wind and bandits in this old Nabatean station, set on caravan route from Hijaz to Petra and Damascus. Awesome views across the sweeping valley floor to Jebel Raqqa. An oddly-shaped sandstone formation, the base of this rock has been worn away by time and the elements. Nearby, hidden in the rocks is an old nook carved hundreds of years ago by Bedouin, used to store food in the desert. At the shaded foot of this mountain is one of our favorite lunch spots during summertime, where we escape the heat and feed the resident birds. 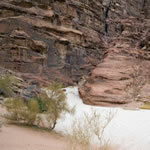 A great place for hiking, the white canyon affords visitors a chance to experience the stirring silence of the desert. The canyon is also scattered with beautiful flowers in springtime. Rum’s most-visited arch, Umm Fruth is arguably its most picturesque as well, a rugged overhang of bright white rock. Visitors can battle vertigo on the climb to the top, which takes just a few minutes. 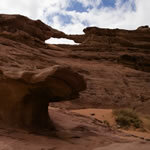 Another of Wadi Rum’s natural rock bridges. This one is set in the Umm al-Samn region far to the south of Wadi Rum Village. This natural spring is one of the oldest in Wadi Rum. Some of the Bedouin families still use it today for their sheep, and sometimes ibexes also come down to drink when there is nobody around. One of the most beautiful canyons in the Wadi. You will cross this canyon by the jeep, camel or hiking. Geber Amra is located on the way to Umm Fruth Rock Bridge . In the middle of this canyon there are beautiful sand dunes. The views are spectacular on the top. Way down by the Saudi border to the southeast, this is Jordan’s highest point. We lead hikes to the top for breathtaking views of Saudi Arabia as well as down the desolate Wadi Sabet and back towards Wadi Rum in the north. One of the most beautiful spots in the north section of Wadi Rum, this sandy canyon is on the side of Jebel Umm Ishrin within a 1 hour hike. 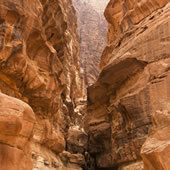 This beautiful canyon in the south of Wadi Rum is on the way to Jabbal Umm ad Dami, in the south part of the Wadi. You can cross it by camel, jeep or foot. In the middle of the canyon, you will be presented with breathtaking views. Spread below the peak of Umm Adami, highest in Jordan, this valley by the Saudi border has the best views of the mountain as well as glimpses into the Saudi Arabian wilderness. You can feel the solitude of the desert here, since relatively few visitors reach this far south. A stunningly beautiful landscape, this canyon is one of our absolute favorites. Beyond the fig tree at its entrance, the hike up the canyon features scrambling along boulders, climbing sand dunes and reaching a great view at the top.